Just a big, happy family looking to stab each others’ eyeballs out at the first opportunity. Want a bit of pointless fun? Horrible Trump “counselor” Kellyanne Conway, known ’round television-land for her furious defense of Trump and her demands that all these people leaking bad things about the White House to reporters stop right now or face Bad Person Jail Time or whatever was caught blasting her White House co-workers in an off-the-record conversation with reporters at a Washington party. ‘So @KellyannePolls held court for awhile. Along with knocking @Reince45, she also made jokes about the ineffectiveness of his RNC world,’ a tweet read. While it’s important to be skeptical of anonymous Twitter accounts purporting to leak insider information about what so-and-so is doing at a Washington party (in this case, at the British Embassy), the tweeter included pictures of Conway engaged in the conversation and Politico was able to confirm her remarks. Possibly because, you know, she was speaking to multiple reporters at the time. In response, White House Press Secretary Sean Spicer emerged from his hiding place to tell Politico that no, no, she was totally making fun of the press, not poor put-upon Reince Priebus, because reasons. Thank god that’s settled. If you can’t trust Sean Spicer and Kellyanne Conway to tell you the truth about potentially embarrassing situations like this, after all, who can you trust? Those are two names synonymous with prodigious truth-telling. No fibbers here. No sir. Wouldn’t dream of it. Something’s really happening EN FRANCE! 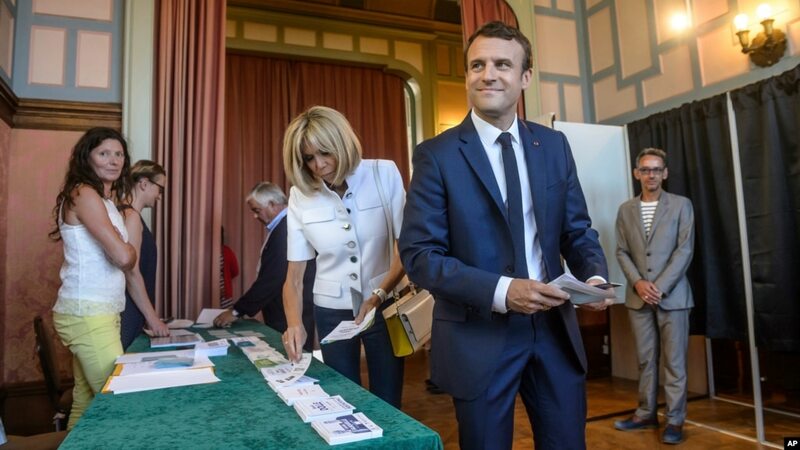 French President Emmanuel Macron and his wife Brigitte Macron pick up ballots before voting in the first round of the two-stage legislative elections in Le Touquet, northern France, June 11, 2017. PARIS — The fledgling party of France’s new centrist president Emmanuel Macron is set for a landslide victory in parliamentary elections, as results from Sunday’s first round of voting showed it taking 28 percent of the vote. That result for La République en Marche and its ally MoDem, which had 4 percent of the vote, puts the pair within reach of an overwhelming majority in the National Assembly with more than 400 seats in the 577-seat lower house if their success carries through a final round of voting next week. Voter turnout, however, hit a record low, as an estimated 52 percent of the population stayed away. That’s being blamed on voter fatigue, after a long and divisive presidential campaign that saw Macron elected last month. Macron’s spokesman Christophe Castaner called the low turnout “a failure of this election”. “We have to take note, we have to restore trust,” Castaner, who is also minister for parliamentary relations, told France 2 television. Still, the result is seen as a strong endorsement of President Macron. Many of those who voted for him in the presidential election, particularly left-wing voters, said they were doing so only to keep Marine Le Pen out. At the time, many of them, and those who abstained, promised to vote against the new president in the parliamentary elections. However, it is clear that a large percentage of them changed their minds. In the 28 days since his inauguration, Macron has made his mark on the international stage: playing President Donald Trump at his own handshake game and winning; criticizing Russia’s Vladimir Putin while standing beside him; and jumping in with new proposals after the U.S. announced a U-turn on climate change. Macron’s La Republique en Marche party members react after the announcement of the first partial official results and polling agencies projections are announced, in Paris, June 11, 2017. Seeing the new president widely acclaimed and admired on the international stage has made voters at home sit up and take note — and decide to give him a chance. The president needs a strong majority in order to push through his promised reforms of France’s strict labor laws, and its ailing social security system. LREM, formed just a year ago to get Macron elected, fielded an unprecedented number of unknown candidates. Most had never held elected office and just five percent were outgoing parliamentarians. The few non-politicians who were known to the public included a woman who used to be a bullfighter, a former anti-corruption judge and a video game magnate. “It is neither healthy nor desirable for a president who gathered only 24 percent of the vote in the first round of the presidentials and who was elected in the second round only by the rejection of the extreme right should benefit from a monopoly of national representation,” said Socialist Party leader Jean-Christophe Cambadelis as results flowed in. 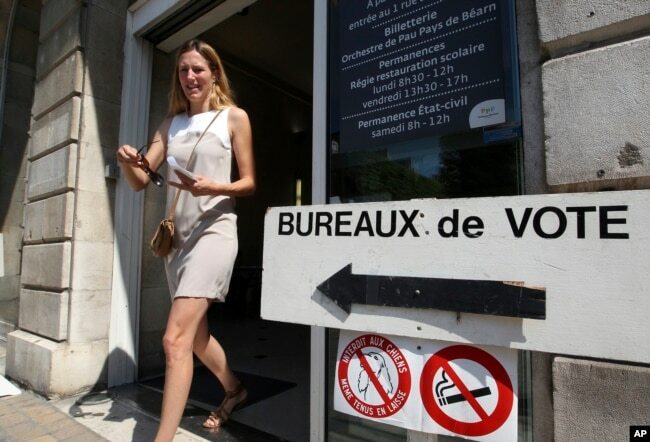 A woman leaves a polling station in the first round of parliamentary elections in Pau, southwestern France, June 11, 2017. Cambadelis later confirmed he had been eliminated from the competition for his Paris seat, one that was previously a safe one for the Socialists. It had been expected that the conservative Les Republicains (The Republicans) would be mobilized to form the largest bloc in the National Assembly. But Macron’s impressive performance in his first month, coupled with astute moves, including naming an LR deputy as prime minister, took the wind from their sails. The party is still expected to form the second largest bloc, with a predicted 95-125 seats. The big losers in this first round were the Socialists, with less than 10 percent of the vote. That would give the PS and its allies just 10-25 seats in the new Assembly. The far-right National Front party failed to capitalize on Marine Le Pen’s record score of 33.9 percent of the presidential second round vote. It scored just 14 percent Sunday. A second round of voting takes place next Sunday. Prime Minister Philippe urged French voters to improve on Sunday’s turnout, stressing the importance of going out to vote.